There are enough tech blog posts on rumors about MacBook Air getting Retina update and on desires of many to get a MacBook Air with Retina display. The latest MacBook Air refresh from Apple did not include Retina display. 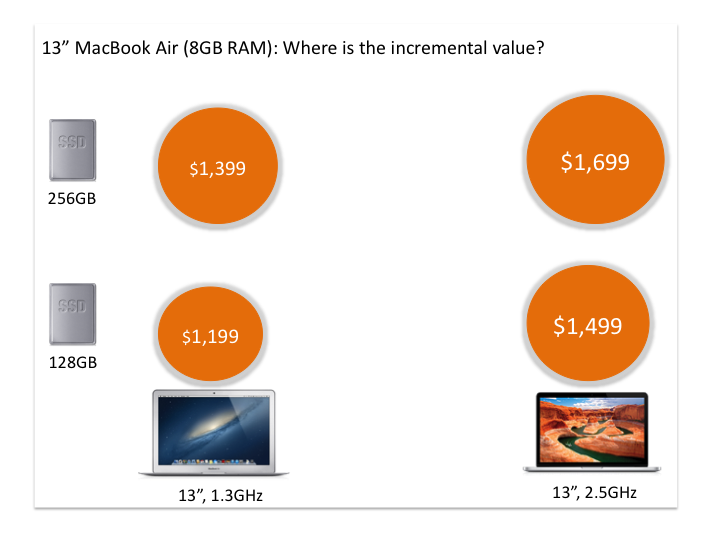 Well the MacBook Pro 13″ version has it. The 15″ version has it. Why not the MacBook Air? The right answer is customer value perception and Apple’s value capture. because the technology is still being perfected it will take time to bring production costs down, she said. And that’s important for Apple, she said. 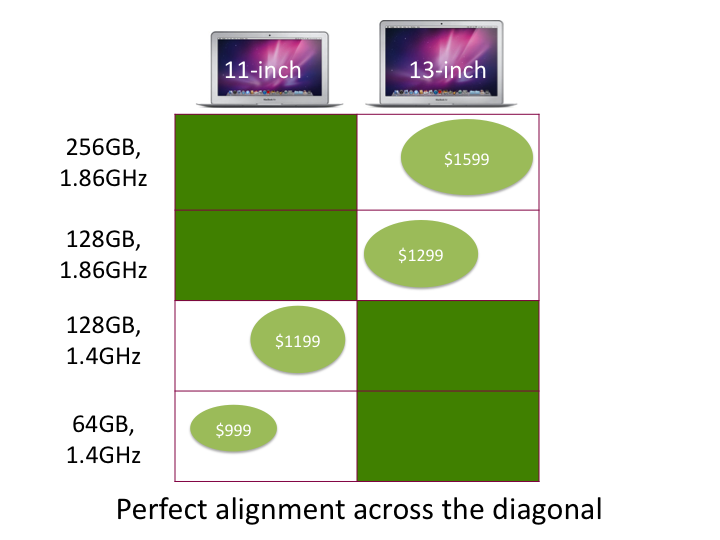 Costs need to come down enough so Apple could use the display in a MacBook Air-class product without jacking up the price too much. Technical issues are not limitations, if it is important Apple can workaround those limitations. And costs? Anyone can compute what the costs are (Henry Ford), but price always comes first. Since when did Apple price its products based on the cost to make them? What jobs does Apple want customers to hire MacBook Air for? Is Apple able to capture its fair share of the incremental value created in the form of price premium? To answer (1) and (2), after misleading you to think that these are really two different segments and two different jobs I posit here that it is really the same segment and same job. Apple is simply offering two different candidates for the same job, making the customer choice be between its two products rather than between Apple’s and a competitor’s product. Given this segment and job – Some prefer the lighter weight and longer battery life and are willing to give up faster CPU, others prefer the CPU horsepower and are willing to compromise on weight and battery life. Now to answer question (3)- Is there incremental value add from Retina screen? 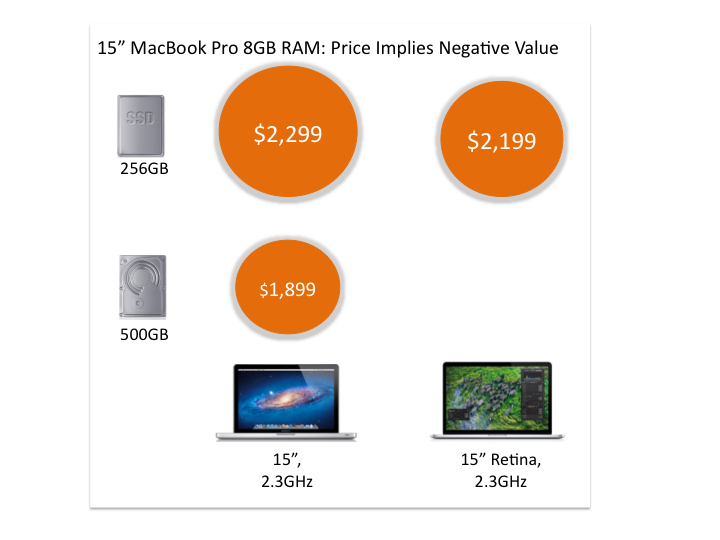 Let us look for clues in how Apple is pricing MacBook Pro 13″ and 15″ versions for this. 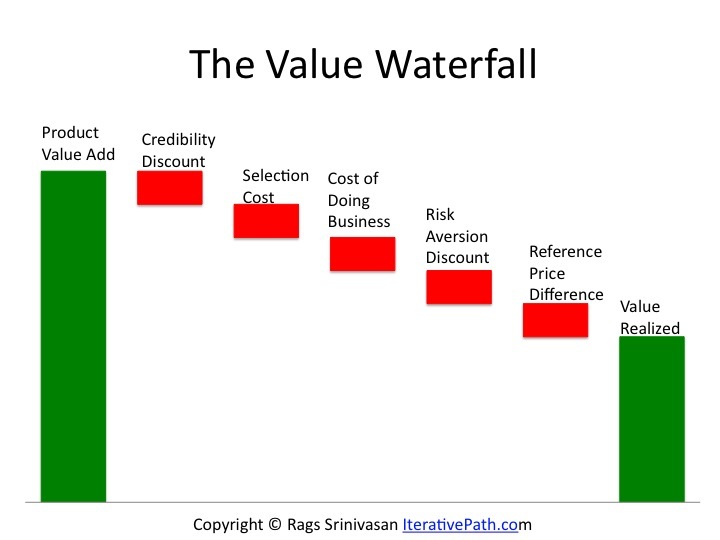 Because price is a function of value and looking at pricing we can approximate customer value perception. Here is the 13″ MacBook Pro version. I normalized with same 8GB RAM for comparison. The Retina version comes with 8GB RAM and only SSD disk. This indicates these customers see no incremental value from Retina. Here is the 15″ MacBook Pro version. 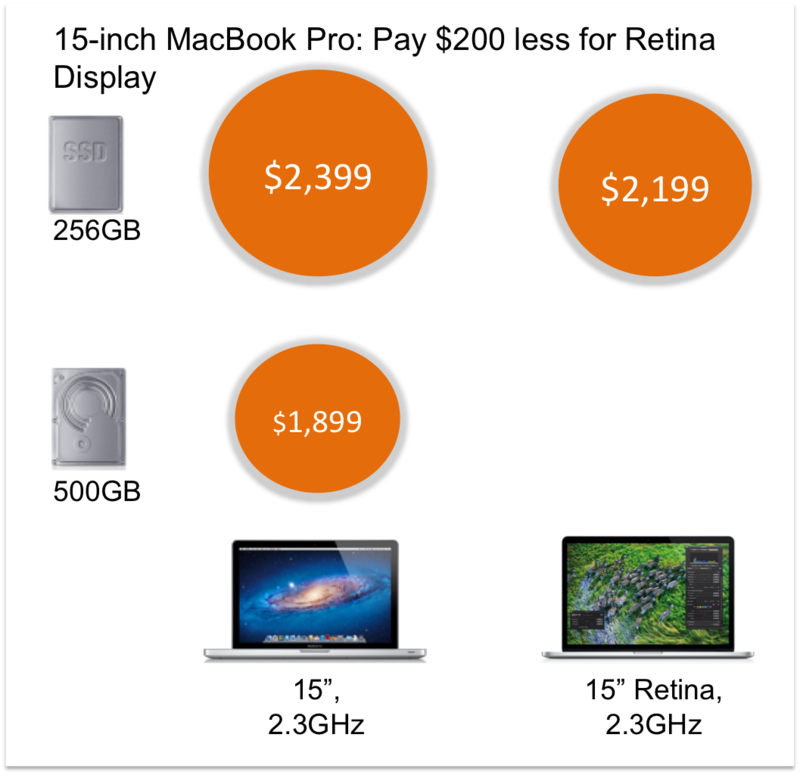 Here the Retina costs $100 less indicating ever worse value perception by customers. 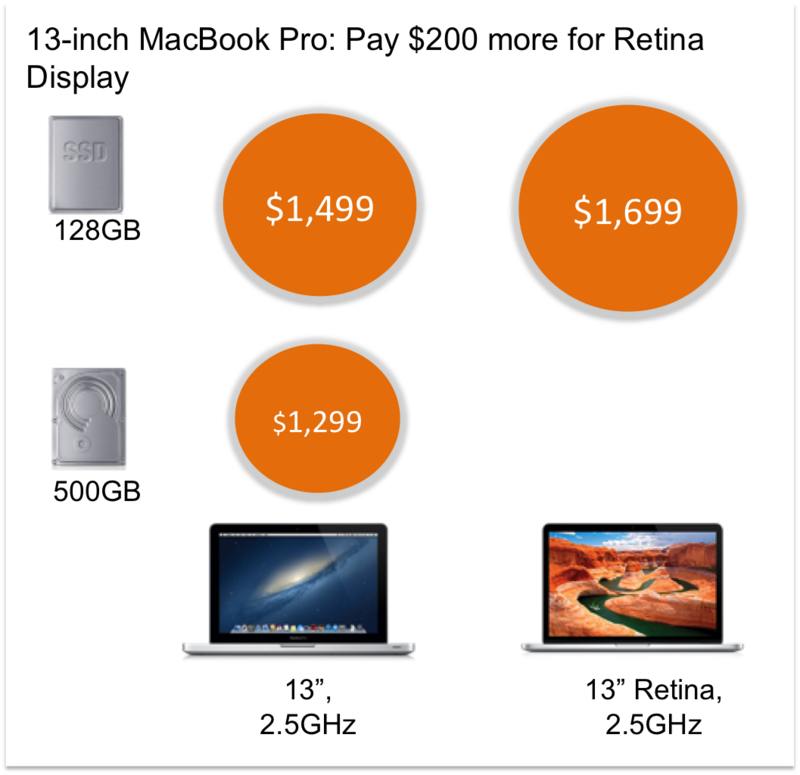 Apple’s data must indicate customers hiring MacBook Pro 13″ version see little incremental value from added feature of Retina display and those hiring 15″ version see their total value decrease. Hence the prices. Gain a processor with almost double the speed (which does not translate to double the application performance). 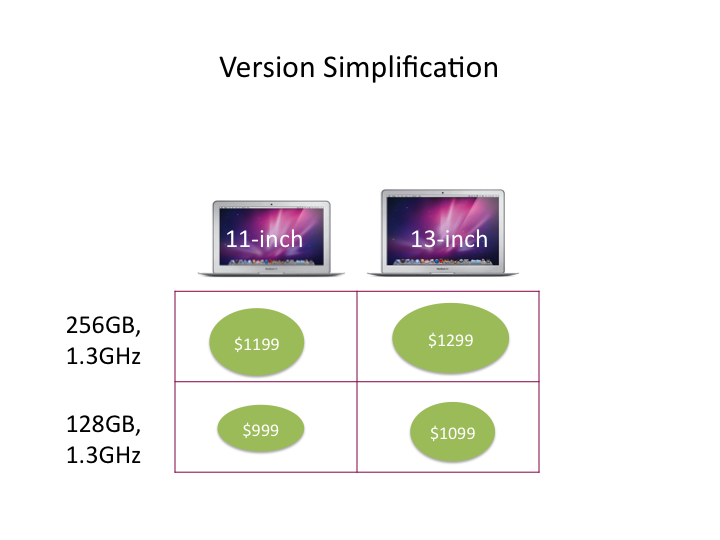 Apple offers CPU upgrade to 1.7GHz at additional cost of $150. There goes half the price differential for still lower CPU speed. Gain retina display – which we saw did not get any value in the 13″ and 15″ versions. 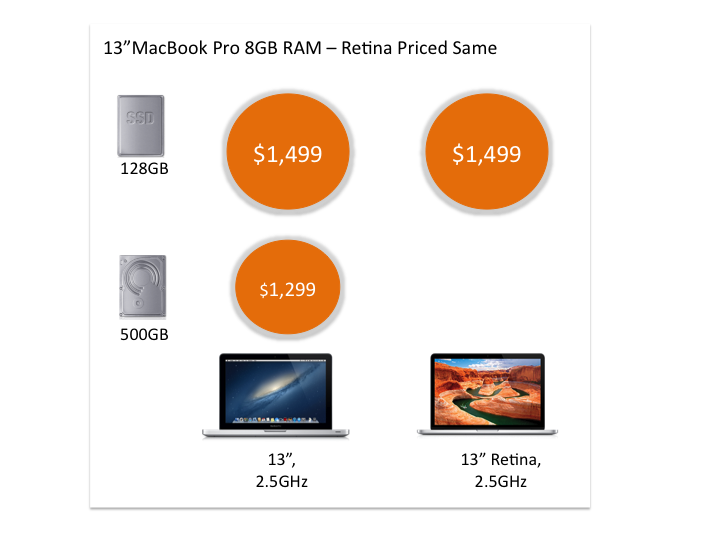 Which implies that if MacBook Air Retina is wedged between these two versions it stands to get no price premium or worse will erode current prices. Apple pretty much will have to offer Retina only MacBook Air model, replacing current models, at the same prices as current models. 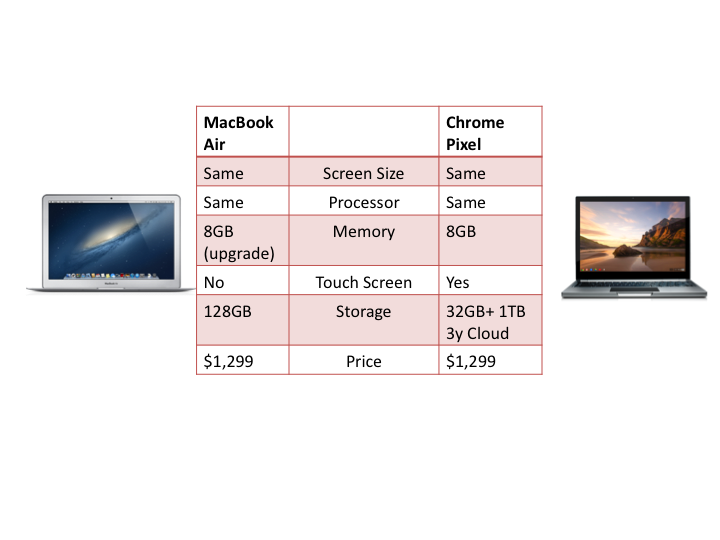 If you do not see MacBook Air with Retina it is because of value and value capture reasons and not technology hurdles. 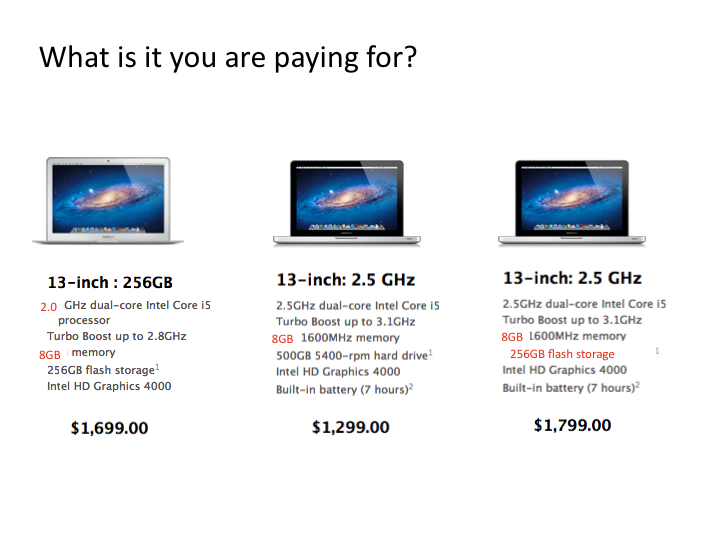 What is it you are paying for with different MacBook versions? 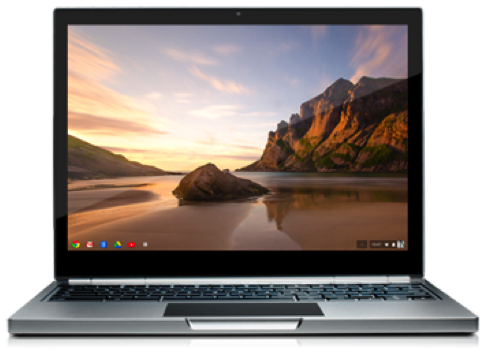 Let us normalize on 13″ screen size and 8GB RAM. Let us configure a 256GB MacBook Air, MacBook Pro with 500GB ATA drive and a MacBook Pro with 256GB SSD. This is the pricing distribution. Can you see how Apple is pricing based on our willingness to pay and not on their cost to make it. 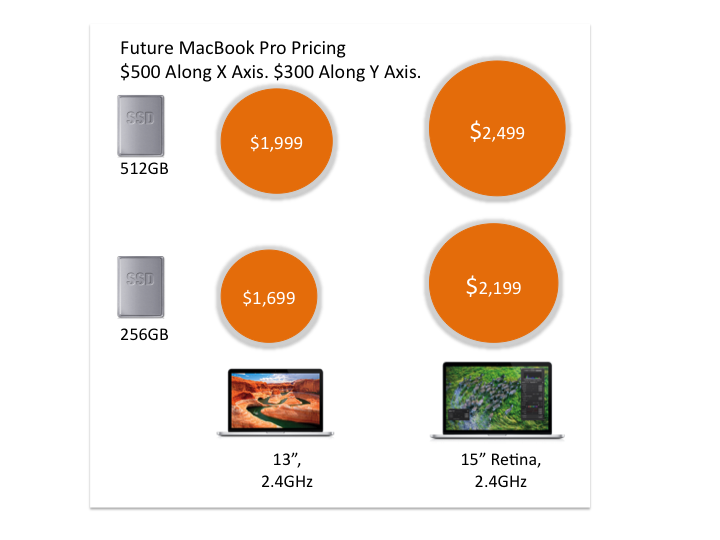 For instance, if the price of MacBook Pro goes up by $500 for going from 500GB ATA drive to 256GB flash, what is contributing to the $100 (1,299 – (1,699 – 500) = $100) extra being charged for MacBook Pro? The faster CPU? Optical drive? None of the pricing is based on cost to Apple, it is highly likely based on their number crunching – knowing how many customers value what at the respective price point. The real magic and amazing thing is in the pricing – pricing driven by analytics and segmentation. Focus just on the fact the numbers end in 99, you LOSE.